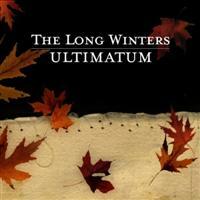 It’s difficult for me to write an objective review of the new Long Winters EP, Ultimatum, because I can hardly bear to listen closely to the first track. It’s not that it’s bad—far from it—just wrenching. “The Commander Thinks Aloud,” which appeared in an electronically remixed form on Barsuk’s Future Soundtrack for America compilation, is a moving meditation on the destruction of the space shuttle Columbia from the point of view of the crew. It makes me think that John Roderick must have been doing the same thing I was that February morning in 2003: saying “no no no no no” to the radio and weeping for our future. The final coda, “The crew compartment’s breaking up,” is almost unbearable in its stately majesty. The rest of the EP, coming two-plus years after the band’s sometimes rollicking, sometimes touching triumph When I Pretend to Fall, is consistent in gravity and musical excellence. The cover image, of falling sere leaves, is appropriate: this is autumnal music. The final two songs on the EP, live solo Roderick performances of “Ultimatum” and “Bride and Bridle” from When I Pretend to Fall, solidify the impression of a band in a more reflective place. The band has gone through a fairly tumultuous history in its five years, with an eight-member “emeritus” list on its official bio page (to be fair, many of them were touring members or producers only, and one—Sean Nelson—has his own band to look after. But Ultimatum makes the case that John Roderick in his own right is a substantial talent and that in the context of this band he can produce some genuinely moving stuff. A big impact from a short release. I’m looking forward to hearing the full-length, due out next year. This review also published at Blogcritics. PS: Shout out to the omnipresent Merlin Mann (of 5ives and 43 Folders fame), who also maintains the Long Winters web site. Small world, innit? This is old news by now, but I found this useful: rather than remembering a multitude of special email addresses to send text messages to friends and colleagues, there is now a service to do it for you: Teleflip. Just send an email to your friend’s phone number at teleflip.com: for the cell number 508-555-1212, that would be 5085551212@teleflip.com. Particularly useful, I think, in automating messaging to mobile customer service representatives—all you have to know is the person’s mobile phone number.